Nothing says summer like an expanse of emerald green lawn. It’s a place for children to play, dogs to romp and you to practice your putting skills before heading out to the golf course. Can’t you just feel your blood pressure dropping? Unfortunately cultivated turf is easily colonized by other plants in addition to the grass seed you so lovingly nurtured. Weeds are a major lawn annoyance. Their seeds often lie dormant in the soil for years; when that soil is disturbed – by heavy rain, by insect activity or by trauma — they seize their chance to germinate. Choosing the right turf for your climate conditions, watering regularly to maintain growth, and mowing to just the right height will go a long way toward maintaining the kind of vigorous grass cover that is resistant to weeds. But even the most vigorous turf will sprout weeds occasionally. 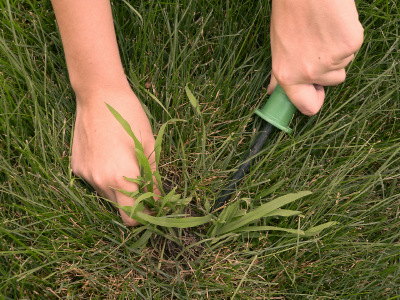 Below is a list of common lawn weeds and some suggestions about how to get rid of them. Dandelions would be such a useful plant, if only they knew their place. (Not your lawn!) They have more vitamins and minerals than most vegetables, and the flowers and the leaves are tasty additions to salads. Dandelions have been used in both traditional Native American and Chinese folk medicine as a natural diuretic in the treatment of liver and kidney disease, swelling, skin problems, heartburn, and stomach upset. They make your lawn look unkempt and overgrown though, and can become part of a personal vendetta for even the most mild-mannered homeowner. There’s more to the dandelion than meets the eye. Specifically, beneath that cluster of flowers and leaves sits a very long taproot. Mowing may remove the cluster but it won’t have any affect on the taproot. The taproot must be either removed in its entirety (weeding) or poisoned (herbicides) in order to prevent the flowers from springing back again. Commercial weed killers like Weed-B-Gon (a popular weed killer designed to be used on a lawn) or Weed-n-Feed (a combination weed killer/fertilizer) are absolutely useless in the fight against dandelions because they never touch the taproot. Nonselective herbicides like Roundup will kill dandelions – but they will also leave ugly brown craters on your beautiful grass. You don’t really want that, do you? The most effective way of controlling dandelion growth is to dig the taproots out by hand with the help of an inexpensive, fork-like gardening tool called a weed digger, and then to sprinkle a little herbicide in the hole you’ve created to kill any portions of the taproot you didn’t succeed in removing. Call it crabgrass, call it finger grass – its official name is Digitaria and it’s characterized by spiky clumps of a different color and texture than the rest of your gorgeous green lawn. Crab crass is an annual, and a single plant is capable of producing 150,000 seeds in a growing season if it is not checked. The most effective means of controlling crabgrass is by applying a pre-emergent herbicide like Dimension or Tupersan that will kill its seedlings as they germinate. Of course you will need to read the label carefully and follow its instructions exactly. This may require measuring your lawn so you know how much to use. You may apply a pre-emergent herbicide more than once, but never apply it proactively to new sod. You will need to water your lawn immediately after applying the herbicide as water activates its ingredients. Determining when to apply a crabgrass pre-emergent herbicide is an art rather than a science, and will depend upon climate conditions where you live. Generally the rule of thumb is to apply it when soil temperatures have been greater than 60 degrees Fahrenheit for ten days in a row. Another weed with a respectable folk medicine heritage, these purplish dark green leaves push out from your lawn giving rise to rattail-like seed heads that are often ten inches high. Hand-weeding is the most effective way of controlling small patches of these plants as their root systems are not particularly deep. They can also be controlled through the application of a post emergence herbicide in early fall, but be careful here to choose a pesticide that is compatible (i.e. will not kill) the turf grass that you’ve planted. Seems almost a shame to get rid of clover – after all if you find one with four leaves, it’s almost as good as winning the lottery, right? Nevertheless there’s no getting around the fact that clover is not what you planted when you laid out your lawn. Of course white clover was actually once an ingredient in most commercial lawn seed mixes. The distinctive white blossoms are pretty, and it does help fix nitrogen in your soil. The problem is that its growing season is much shorter than your lawn’s, and when it begins to go dormant in mid-summer, your grass is left with ugly brown patches. To remove clover, apply a post emergence herbicide in early fall. (See the section on Plantains above.) An herbicide containing either triclopyr or mecoprop +2,4-D + dicamba works best, and make sure to choose a windless day for the application. Curly dock can be unsightly, and dangerous to the household pets – the ASPCA lists yellow dock as being poisonous to dogs. Before it flowers, it’s a spiky green plant with serrated leaves close to the ground; its flowers shoot up on long narrow spikes arising from the center of the plant. Like dandelions, curly dock has a long tap root so the most effective way of getting rid of it is to dig the plants out by hand, removing as much of the root as you can, and then to sprinkle a little bit of herbicide into the hole. Carpetweed is an annual that grows close to the ground, sprouting rapidly as the summer grows hotter. Its root system is very shallow so it can easily be weeded out by hand. Need to know how to get rid of the flat leaf or coccle burr type sticker weeds. The weed with the little yellow flower. My back yard has been taken over by a small leafy weed (I don’t know what it is, maybe clover, but it didn’t flower out). What’s the most inexpensive and/ or efficient way to combat this weed ???? What kind of killer do I need to use to kill stickers in in my yard? And when do I start to treat the lawn? Dandelions definitely have their benefits! It’s too bad they spread like wildfire and can wreak havoc on the rest of the yard. Thanks for all the info about lawn weeds you provided – here’s an infographic that has accompanying pictures as well. Could be helpful to those trying to figure out what weeds are bugging them! My problem is with a perennial crab-grass like weed that grows into huge clumps. If sprayed with roundup, it just leaves a huge brown spot and the next spring more of the grasses emerge around it. It is spreading like wildfire! I desperately need help! I would love to know how to get rid of the stickers with the yellow flower and those other pokey plants that are just all green!